That is a drop-in sink not a flush-mount. It's Blanco's new MicroEdge™ sink and it just won an honorable mention in KB+B's Product Innovator Awards for 2009. Blanco's MicroEdge™ was one of nine products named as a stand out for the year. Since the advent of undermount sinks ten years ago, nobody's really done anything with drop-in sinks. That was until Blanco took another look at them and decided that the traditional drop-in kitchen sink needed a face lift. 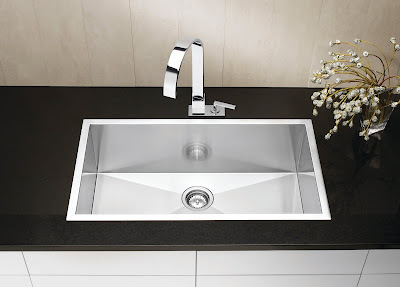 So Blanco developed a 1.25mm thick sink rim and called it MicroEdge™. Drop-ins are usually less expensive to deal with and if you're replacing an existing sink, you options have always been limited to the traditional 17- to 18-gauge stainless steel the rest of the sink was made of. Blanco found a way to make the transition from an 18-gauge stainless bowl to a 1.25mm rim. Pretty slick! Go to Blanco's website to see their complete collection. 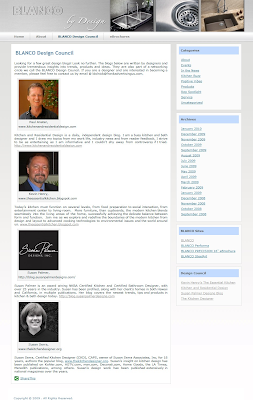 BLANCObydesign.com provides a forum for homeowners, kitchen and bath design profesionals, BLANCO representatives and showroom sales associates to exchange information. Here you’ll discover the latest product news, program introductions, support tools, sources of inspiration, design ideas and more. BLANCObydesign.com will also create a channel to lend your voice to the BLANCO community. Just hit the Comments link to share new ideas, or anything that’s on your mind. Your contributions are the key to making this blog successful for all. The center tab on Blanco by Design's page is something called the Blanco Design Council. Blanco's Design Council is intended to be a group of professionals who've been brought on board to lend a hand and an ear to Blanco's new undertaking. At the top of that list you'll find yours truly. So bravo to Blanco on the recognition awarded to MicroEdge™ and three cheers for wading into the world of Social Media. Thank you for the wonderful article! We're excited to be part of the blogging world. And I for one am glad to have you Lori, keep it up! I do love blanco sinks! Ahhh, yes. I love the glamor and prestige that comes with a list arranged alphabetically. We just installed several new Blanco micro edge sinks in our showroom and they look stunning! I'll take some pictures and post them to the Banner FB page so you can see, but their Arcon series is quite impressive as well. It's about time someone came up with a sink that can be the focal point of the kitchen! This is a good looking sink. They really are worth the money, and they have a great appearence to them. Thakns for keeping us informed.